Butterflies are popular, well-known insects with large, colorful wings covered with tiny scales. Together with moths, butterflies make up the order Lepidoptera, which contains over 150,000 species or kinds. Scientists estimate that about 15,000 butterfly species exist worldwide. During its life cycle, a butterfly undergoes a complete metamorphosis (pronounced met-uh-MORE-fuhsiss) during which it changes from a leaf-eating caterpillar to a nectar-sipping butterfly. Butterflies are one of our very favorite insects. The fact that they do not sting or bite, are brightly colored, and do not become pests in people's homes has something to do with why most people enjoy seeing them fly around and would seldom think of killing one (as one might do with other insects thought of only as "bugs"). Most people think that butterflies simply make the world a prettier place. However, like other life forms in the world, they have a place and serve a purpose. For the plant world, butterflies pollinate or carry pollen from plant to plant, helping fruits, vegetables, and flowers to produce new seeds. From the animal point of view, butterflies are near the bottom of the food chain and provide food (especially in their caterpillar stage) for birds, mammals, and other insects. It is thought that the word butterfly may have originated in England when people started calling the yellow Brimstone or the English sulfur a "butter-colored fly" because the pretty insect reminded them of the color of butter. Eventually it was shortened to "butterfly." The scientific name of its order, Lepidoptera, means "scaly wings" in Latin. This is a correct description since their wings and their bodies are covered with tiny scales. Butterflies and moths are the only insects that have scales. Moths and butterflies are mainly different in their appearance and activities. Moths fly mostly at night and usually have a dull color. Butterflies are active during the day and are brightly colored. Their bodies are thin and hairless, while most moths have plump and furry bodies. Chrysalis: A soft casing, shell, or cocoon protecting the dormant pupa of insects during metamorphosis. Metamorphosis: A complete change of form, structure, or function in the process of development. Pupa: An insect in the nonfeeding stage during which the larva develops into the adult. Butterflies are found nearly everywhere in the world except Antarctica. They have lived on Earth for at least 150 million years and range in size from the Western Pygmy Blue, which is smaller than a dime and found in North America, to the Queen Alexandra's Birdwing of Papua New Guinea, which has a wingspan of up to 11 inches (28 centimeters). Although some tropical butterflies can live up to one year, the average life span of a butterfly is at most two months. Butterflies display every color of the rainbow in their wings, and no two butterflies are exactly alike. This coloring serves many purposes: from attracting a mate, to blending in with its surroundings, to warning its enemies that it is poisonous and should be avoided. One of the most interesting things about butterflies is their unique life cycle. When a butterfly changes from a slow-moving, fat caterpillar to a colorfully winged, beautiful flying insect, one of nature's most magical events occurs. This metamorphosis happens to most insects, but not as dramatically as it does to a butterfly (the word metamorphosis is Greek for "change in form"). There are four stages in a butterfly's metamorphosis. Every butterfly begins life as an egg. After mating, the female lays her eggs (she actually "glues" them) in small clusters on the leaves of a certain plant. Each species selects its own plant, and the eggs of each are different in shape and markings. In many species, the female dies shortly after doing this. When the egg hatches, the larva emerges. Actually a tiny caterpillar eats its way out the egg, and then proceeds to eat the eggshell. This caterpillar is a true eating machine, and it continues to eat the leaves of the plant where its mother laid her eggs. Caterpillars have one goal—to eat as much as possible—and in their short lifetimes they may eat as much as twenty times their own weight. Caterpillars naturally grow quickly with all this eating, and since their skin cannot stretch, it splits and is shed. This is called molting and it happens several times as the caterpillar gets fatter and fatter. It is at this slow-moving stage that many a caterpillar is devoured by a hungry bird. Still, many protect themselves by using their colors to blend in with their environment. Other have sharp spines or prickly hairs on their bodies to deter predators, while still others have circles or spots on their skin that trick their predators into thinking that the caterpillar is really a larger animal than it is. If the caterpillar survives and reaches its full size, it attaches itself to a stem from which it hangs upside down. It then sheds its skin one last time, and the old skin hardens almost immediately and becomes a tough shell called a chrysalis (pronounced KRIS-uh-liss). The caterpillar has now become a pupa (pronounced PEW-puh) inside a chrysalis, and its body parts are broken down into a thick liquid that will feed special, pre-programmed cells that have lain dormant in the caterpillar. These cell clusters start to form specialized body parts, like wings, legs, and eyes of a new creature. This process goes on for days, weeks, and sometimes months, according to the type of butterfly that will emerge. The final stage occurs when an adult butterfly finally pushes itself out of its chrysalis, looking nothing like the caterpillar that it was. When the butterfly breaks through the now-soft shell, its wings are wet and crumpled and it must rest while it expands its wings and pumps them full of blood. Continued flapping makes them strong, and soon the adult butterfly is ready to fly away and begin this cycle all over again by looking for a mate. Every adult butterfly is covered with millions of tiny scales that help it to control its body temperature. They also can help it escape from a predator's grip since they rub off easily. It is these scales that give but terflies their beautiful colors. A butterfly's body is made up of three parts: head, thorax, and abdomen. On its head are two long antennae, which it uses as feelers to touch and to smell things. They also have two large compound eyes, which means that each is really thousands of eyes formed together. This allows a butterfly to see in all directions at once. They also have a long hollow tube called a proboscis (pronounced pro-BOSS-siss), which they use like a straw to sip the energy-rich, sugary liquid called nectar produced by flowering plants. A butterfly's wings are its most important part since they enable it to move about for food, shelter, a mate, and all the other things it needs. Its wings are very strong, and they are supported and shaped by a network of veins, just like those in a leaf. Different species have different-shaped wings that make each fly in a different manner. Those with large wings flap and make long glides, while those with wide wings flutter and flit or move with short bursts. Those with long, thin wings fly the fastest, and those with short, triangular wings can zigzag and dart about quickly. No matter how they move about, butterflies are incredible fliers, and some migrate over 3,000 miles (4,800 kilometers) to spend the winter in a warmer place. 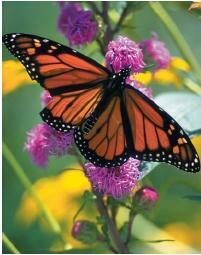 The well-known Monarch butterfly flies to Mexico from North America before the autumn chill arrives. Those living east of the Rocky Mountains fly the longest, traveling over 2,000 miles (3,200 kilometers) to get to the same spot in Central America. Some scientists believe that they find their way by using the position of the Sun as a compass, while others think that they are able to detect changes in light waves that are filtered through the clouds. However they do it, millions make the journey south every year, and their offspring make their way north again the following spring. The ancient Greeks are said to have believed that when people die, their souls leave their bodies in the form of a butterfly. Their symbol for the soul was a young girl named Psyche who had butterfly wings. Today, we know that real butterflies are extremely sensitive to changes in their environment. More and more, as their habitats are being destroyed and endangered by pollution, pesticides, and other human activity, butterflies are threatened. Some rare species may have already become extinct. Lovely website with lots of butterfly info! Well written. Your website is fantastic! It definitaley clarified my questions on butterflies. Very helpful for reports and presentaions. very informative. answered my questions, very well. thanks. The butterfly is truly miraculous and is a great way for those of us who long for proof of gods existence to clearly see he is not only present but loving in ways a human s simply can not put into words. This article was amazing and truly inspiring. It will be the perfect topic for the paper I need to help write. I have always loved butterflies they are so beautiful!